While Susan Bergman is away enjoying her sunny vacation she needed a few volunteers to be guest bloggers so I thought I’d raise my hand and volunteer. So many people have asked me what my “secret” is and what am I doing differently? So I thought I would write a little about food, diet and motivation in this post. Even at my highest weight I was still very active but the “hitch in my giddy up” as my Grandpa would say was my relationship to food. I’m a foodie! I love to eat, cook, bake and entertain. Food just makes me happy! I eat when I’m content, sad, stressed and bored. But food was also making me fat and unhealthy. So I decided to change. Through the course of the last 9 months I’ve lost 53 lbs, changed my relationship with food, learned to stay motivated and focused on my goals and also completed my first half marathon. Food is fuel…Eating is not a part-time job or a hobby. 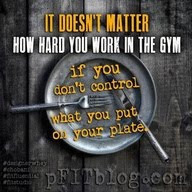 You can’t out train a bad diet. No matter how hard you work out in the gym if you can’t control what you’re shoving into your pie-hole nothing good can happen. Eat less…move more! No magic pill, potion or powder will take the place of hard work, daily focus and sacrifice. Setting goals has been one of the biggest factors in my success. I have set daily, weekly, monthly and yearly goals. This has helped me stay focused on the big picture. 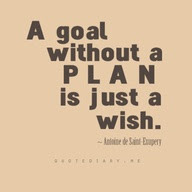 What do you need to do to attain your goals? Start breaking it down bit by bit and soon you’ll have a plan. Find a race or walk that you can set your sights on doing. Or find something else that motivates you to stay on track. The second part of staying motivated for me has been the hardest…making myself accountable to my family, friends and the ladies on ML Fit Camp. It has been terrifying and liberating all in the same breath. It’s very easy to have grandiose goals and ideas it’s another thing to write those goals down and share them with the world. Accountability, I have discovered is part of the key to success. Don't forget to visit Arlene and follow more of her journey at Living Life Fully at Fifty! Love Arlene! She is inspiring! !